The Deceitful Onion Bulb. A Blessing to Smuggle. The Conjuror of Rain. 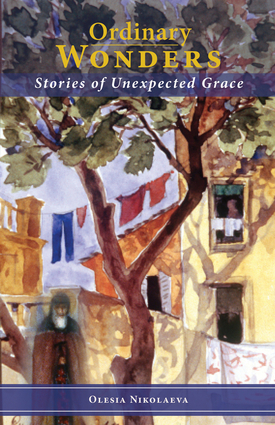 In this collection of stories as whimsical as their titles, award-winning author Olesia Nikolaeva poignantly recounts life for Christian believers in Soviet and post-Soviet Russia. In a manner reminiscent of the bestselling Everyday Saints these tales reveal a common theme - the subtle, sometimes imperceptible movement of Divine Providence at work in the lives of saints and sinners alike. Her writings bring us to what the ancient Celts called "thin places" where the boundaries of heaven and earth meet and the sacred and the secular can no longer be distinguished. Olesia Nikolaeva is a prolific and award-winning author, poet, and essayist. She has been composing verse since her early youth and was first published at the age of seventeen. Bishop Tikhon (Shevkhunov), author of the 2011 bestseller Everyday Saints, called her "a trailblazer in Russian Orthodox prose." Alexandra Weber holds an MA in Russian Literary Translation from Columbia University.